Բախի բնագիր ռիթմը՝ «Sonata No. 1 in G minor for solo violin (BWV 1001»)Audio (օգնություն • ինֆո). Քառամաս հարմոնիաները գոյություն են ունեցել նախքան Բախը, սակայն նա ապրել է մի ժամանակաշրջանում, երբ արևմտյան ավանդության մեջ լադային երաժշտությունը առանձնացված էր տոնայնություն համակարգից: Այս համակարգում երաժշտությունը զարգանում է մի ակորդից մյուսը ըստ որոշակի կանոնների, որոնցից յուրաքանչյուրը բնութագրվում է չորս նոտաներով: Չորս մասից բաղկացած հարմոնիայի սկզբունքները կարելի է հանդիպել Բախի ոչ միայն խմբերգություններում, այլև, օրինակ, բասային նվագակցության մեջ: Այս նոր համակարգը հանդիսանում է Բախի ոճի հիմնաղբյուրը և նրա ստեղծագործությունները մեծ մասամբ համարվում են զարգացող սխեմայի ձևավորող կանոնները, որոնք կիշխեն ապագա դարերի երաժշտության արտահայտման մեջ: Բախի ոճի և նրա ազդեցության մի շարք օրինակների թվում են. Բախի մոտետները (BWV 225–231) սուրբ թեմաներով գործեր են, որոնք գրված են երգչախմբի և կոնտինյուի համար: Նրանցից որոշները ստեղծվել են հուղարկավորությունների համար: Բախի կողմից ստեղծված վեց մոտետներն են. ↑ 1,0 1,1 http://www.theguardian.com/music/2014/mar/06/js-bach-329th-birthday-scholars-numerologists — 2014. ↑ 3,0 3,1 3,2 German National Library, Berlin State Library, Bavarian State Library et al. Record #11850553X // Gemeinsame Normdatei — 2012—2016. ↑ 6,0 6,1 6,2 German National Library, Berlin State Library, Bavarian State Library et al. Record #11850553X // Gemeinsame Normdatei — 2012—2016. ↑ 8,0 8,1 8,2 8,3 8,4 8,5 Internet Broadway Database — 2000. ↑ 10,0 10,1 10,2 International Music Score Library Project — 2006. ↑ 11,0 11,1 11,2 filmportal.de — 2005. ↑ 12,0 12,1 12,2 Бах Иоганн Себастьян // Большая советская энциклопедия: [в 30 т.] / под ред. А. М. Прохоров — 3-е изд. — М.: Советская энциклопедия, 1969. ↑ John Eliot (2010). "Cantatas for Christmas Day: Herderkirche, Weimar" (PDF). pp. 1–2. Retrieved 27 December 2014. ↑ Christoph (1996). "From konzertmeister to thomaskantor: Bach's cantata production 1713–1723" (PDF). pp. 15–16. Retrieved 27 December 2014. ↑ British Library. On-line gallery.biography. ↑ III.2 , 353 16 January 2013 , Felbick 2012, 284. In 1746, Mizler announced the membership of three famous members, Musikalische Bibliothek, III.2 , 357 16 January 2013 . ↑ Musikalische Bibliothek, IV.1 , 108 and Tab. IV, fig. 16 (Source online); letter of Mizler to Spieß, 29 June 1748, in: Hans Rudolf Jung und Hans-Eberhard Dentler: Briefe von Lorenz Mizler und Zeitgenossen an Meinrad Spieß, in: Studi musicali 2003, Nr. 32, 115. ↑ Breig, Werner (2010). " 22 February 2018 at the Machine." (pp. 14, 17–18) in 6: Clavierübung III, Schübler-Chorales, Canonische Veränderungen  11 September 2017 at the Machine. of Sebastian Bach: Complete Organ Works. 5 September 2015 at theWayback Machine. .
↑ Carl Philipp Emanuel & Johann Friedrich (1754). "". Musikalische Bibliothek () (in German). Leipzig: Mizlerischer Bücherverlag. IV.1: 173. ↑ Hans Gunter Hoke: "Neue Studien zur Kunst der Fuge BWV 1080", in: Beiträge zur Musikwissenschaft 17 (1975), 95–115; Hans-Eberhard Dentler: "Johann Sebastian Bachs Kunst der Fuge – Ein pythagoreisches Werk und seine Verwirklichung", Mainz 2004; Hans-Eberhard Dentler: "Johann Sebastian Bachs Musicalisches Opfer – Musik als Abbild der Sphärenharmonie", Mainz 2008. ↑ Don O. Franklin. "The Libretto of Bach's John Passion and the Doctrine of Reconciliation: An Historical Perspective", pp. 179–203 Archived 31 January 2016 at the Wayback Machine. in Proceedings of the Royal Netherlands Academy of Arts and Sciences Vol. 143 edited by A. A. Clement, 1995. ↑ Wolfgang Schmieder (editor). 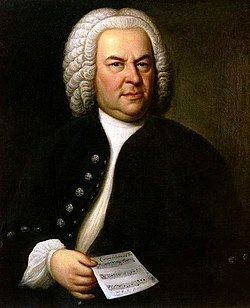 Thematisch-systematisches Verzeichnis der musikalischen Werke von Johann Sebastian Bach. Leipzig: Breitkopf & Härtel, 1950. Unaltered up unto its eighth printing in 1986. 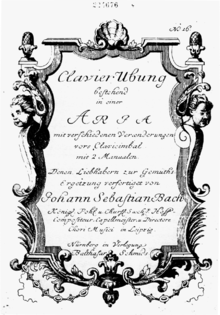 Wolff Christoph (2000)։ Johann Sebastian Bach: The Learned Musician։ Oxford: Oxford University Press։ ISBN 0-19-816534-X , second edition, 2013, W. W. Norton, New York and London, 0-393-32256-4 pbk. Boyd, Malcolm, Ed., Oxford Composer Companions: J. S. Bach, Oxford University Press, 1999. Dörffel Alfred (1882)։ Thematisches Verzeichnis der Instrumentalwerke von Joh. Seb. Bach (գերմաներեն)։ Leipzig: Edition Peters Text "C.F. Peters" ignored (օգնություն) N.B. 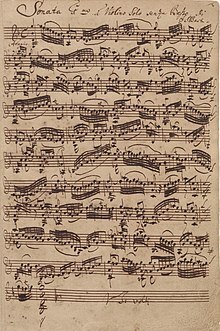 : First published in 1867; superseded, for scholarly purposes, by Wolfgang Schmieder's complete thematic catalog, but useful as a handy reference tool for only the instrumental works of Bach and as a partial alternative to Schmieder's work. Wolff, Christoph, ed. (1998), The New Bach Reader: a life of Johann Sebastian Bach in Letters and Documents, W. W. Norton; 1945 and 1972 eds. by Hans T. David and Arthur Mendel.